Salvation And Survival: Are You A Sinner or A Saint? This question really makes you stop and think, doesn't it? I have to admit that when my husband, Mark, posited it to me, my immediate thought was, "Well, of course, I am a sinner. There was only one human being who wasn't, and that is Jesus". But then, I hesitated, and thought, "Wait a minute, but how does my Lord see me? Isn't that my true identity"? If you scour the internet, you will find a wide variety of opinions ... some theologians and Bible teachers will call Christians sinners; while others declare we are all saints; and yet others try to walk the line and call us both saint and sinner. But I wanted to definitively know in my heart what I believed, and the only resource that mattered to me was the Bible. 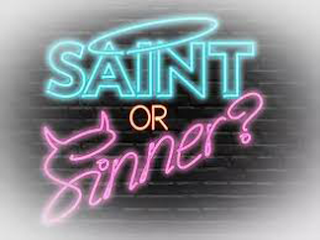 So, I began my quest to determine who I am ... sinner or saint. In a sense, all human beings, as a category, are sinners because we are born in sin. So, it is not difficult to think of ourselves as sinners because we know we are capable of sinning. But when we take a look at the word "saint" in the original Greek (hagios) it is used to designate all believers or people set apart for the Lord and His Kingdom. It is not used to typify those Christians of exceptional holiness, or those who have gone on to be with the Lord in heaven, but rather any and all who are reborn into a new identity. And Scripture backs this up in 2 Thessalonians 1:10, which reads, "... when He comes to be glorified in His saints on that day [that is, glorified through the changed lives of those who have accepted Him as Savior and have been set apart for His purpose], and to be marveled at among all who have believed...". Now, there will always be those Christians who don't see themselves as this new creation called "saint" and want to cling to their old identity. They will tell you that if we don't still see ourselves as sinners, then what value does the Cross have to us? My answer to that is simple: the Cross is the reason that my identity has changed from sinner to saint; it is the catalyst that transformed me. Did not the Apostle Paul say, "If any man is in Christ he is a new creation. Old things are passed away, behold all things are become new." True, Paul called himself "the foremost of sinners" in 1 Timothy 1:15. But, as is often the case, we tend to read Scripture out of context. A more careful study shows that he is referring to his former self, i.e., the "old Paul" rather than the new one. And that may be why he tends to refer to the readers of his letters as "saints" to remind them of who they are, and who they have been called to be. And that is an important distinction. "Saint" is both a description and a calling of the Christian. This is made very clear in Paul's letter to the Corinthians: "To the church of God in Corinth, to those sanctified (set apart, made holy) in Christ Jesus, who are selected and called as saints (God’s people), together with all those who in every place call on and honor the name of our Lord Jesus Christ, their Lord and ours...". To be a sinner is to be separated from God, with no relationship. But Scripture tells us in Ephesians 2, that "through Him we have a [direct] way of approach in one Spirit to the Father". When we are reborn we enter into a new relationship with our Creator, and we are"fellow citizens with the saints (God’s people), and are [members] of God’s household". We now identify as a saint! But what about the times we hurt others with our sins? How can we possibly think of ourselves as a saint then? That is where repentance comes in. With this act of confession and asking God for forgiveness, we show a new nature that is in relationship with God; a new nature that is growing towards the image of Christ -- and which definitely is not the nature of a sinner. So, after all this discussion, and back and forth, how do you view yourself? Are you a saved sinner, or a sinning saint? I will tell you how I have determined this question for myself... I know I am a Christian who is growing in holiness, while still struggling with sin in my life. But that is the old nature that is still trying to control me. I KNOW I am a new creation. I KNOW I have been called to a special purpose and called to be holy because God is holy. And I know Jesus is the ultimate picture of saint. I also know that when we are saved, we are identified with Christ by grace through faith. And I believe that my faith in Christ radically changes not only my identity and my walk, but how God sees me. He no longer sees a broken vessel, but a renewed and restored receptacle of His grace and mercy. How can that be labeled a sinner? From now on, I will only answer to the name Saint. So, I ask my original question to you ... Are you a sinner or a saint? 1 Corinthians 6:11 And such were some of you [before you believed]. But you were washed [by the atoning sacrifice of Christ], you were sanctified [set apart for God, and made holy], you were justified [declared free of guilt] in the name of the Lord Jesus Christ and in the [Holy] Spirit of our God [the source of the believer’s new life and changed behavior]. Are the terms mutually exclusive? I have a hard time picking one. This is something I will have to put some thought into. I believe it is Romans 6 that is a picture of us as sinners. Romans 7&8 point to our transformation into saints. It is a matter of being transformed and Satan likes nothing better than to keep us guessing or doubting. With Christ we are a new creation, growing towards a fullness of the image of Christ. Once that transformation begins, you leave the old identity behind. Dear Pam,Good morning and God bless your day. Yes we are partakers of his divine body and His blood.A new creation.Walking in His Spirit.Now saints.When I was younger and people would ask did I know where I was going when I died and I was still very young in the Lord so I wasnt sure. after awhle I knew where I was going and I never had to hesitate in my answer.I know the same thing now about being a saint or a sinner. Thanks, Michele. It's always affirming when your experience mirrors another's. Our Lord is full of such Mercy and Grace!